by Gregg L. Frazer. Lawrence, KS: University Press of Kansas, 2012. 312pp. Hardcover $34.95 ISBN: 978-0-7006-1845-3. Paper (July 2014) $19.95 ISBN 978-0700620210. If it is true that America’s religious past is not dead, then the founding period appears to be particularly vital. A host of vested interests have sought to claim the religious beliefs of America’s founders for present day purposes, contributing to a frequently polarized debate between those who seek to highlight the Christian identity of the founders, and those who emphasize their Deistic leanings. In his new book, THE RELIGIOUS BELIEFS OF AMERICA’S FOUNDERS, Gregg L. Frazer seeks to disrupt this ideological discussion, and to offer a middle ground. Frazer argues that there existed, in the 18th century, an identifiable religious undercurrent worth recognizing less for its popularity, and more for its influence among the most educated and influential early Americans. He argues that many key founders were neither Christian nor Deist, but rather “theistic rationalists,” a term of his own choosing that combines some qualities from both categories, with a bent all its own. While the attempt to identify a new religious category and to fill it with a notable coterie of influential Americans is not entirely successful, this well-researched and scholarly examination vivifies and illuminates the religious atmosphere at the time of the founding. Creating new categories is something of a cottage industry for academics, and for every effort to establish new categories there are a host of scholars ready to tear them down. In many ways, entering into the terminological debate at the heart of the book distracts from what is most valuable within it. Yet such is the fray that Frazer has entered into with his coining of the phrase “theistic rationalism,” and couching it between the competing categories of “Christian” and “Deist”, that it requires some elucidation. As Frazer argues, the founders’ theistic rationalism was not identifiable with a particular sect of Christianity. It was rather a pervasive, ecumenical theology, born of the age of reason and common to most rational and educated men. Theistic rationalists believed in a benevolent, unitary, present and active God that responded to prayers and intervened in the world. They believed that the primary value of religion was to promote a moral society, and that all religions gesture to the same God. They tended to think highly of Jesus, but did not think he was a deity. They believed in an afterlife, and in revelation, but only insofar as revelation agreed with one’s own personal dictates of reason. This last point is important because it allows Frazer to claim that all of the founders he treats in this book were theistic rationalists, even though they often had disparate responses to important religious questions. The [*292] obvious problem here is that it makes for a very broad category in which various members may hold different views about the afterlife, the supernatural world, the existence of miracles, and so forth, all the while subsumed neatly under Frazer’s categorical heading. One may question whether the category is simply too broad to be of much use. The breadth of Frazer’s category is made all the more suspect by the fact that he defines the terms “Christian” and “Deist” along strictly institutional lines. He describes a Christian as one who believes in: “…the Trinity, the deity of Jesus, a God active in human affairs, original sin, the Virgin Birth, the atoning work of Christ in satisfaction for man’s sins, the bodily resurrection of Christ, eternal punishment for sin, justification by faith, and the authority of the Scriptures” (p.18). On the face of it, this would seem to be a reasonable list. The term “Christian” cannot mean just anything, and the largest sectarian institutions of the time would all fall within Frazer’s definitional limits. Frazer argues that because his selected founders did not believe in all, or many of these doctrines, we should therefore not refer to them as Christians, even though that is how they often referred to themselves. This all leads to the broader question of whether it is institutions or individuals that define religious membership. One may well argue that throughout the history of organized religion, there have always been a significant percentage of adherents who do not accept fundamental tenets of their professed religion. This is true not just for small matters of belief, but central ones as well. A recent Harris poll, for example, found that 6 percent of American Catholics, and 8 percent of American Protestants do not profess a belief in God at all (Taylor, 2009). In Denmark, a majority of Danes still call themselves Christian, pay taxes to a church, get married in churches, and have their children baptized, and yet only 24 percent claim to believe in a “personal God” (Zuckerman, 2008). While Frazer does an excellent job of clarifying the many ways in which the beliefs of his chosen founders differed from the established Christian orthodoxy of the time, it does not necessarily follow that these doctrinal differences should preclude them from being viewed as Christian, especially when that is how they themselves chose to identify. Ultimately, however one chooses to respond to this conundrum, Frazer does compel us to admit that if we consider these founders Christian, we must stipulate that they were of a very particular, and idiosyncratic kind. 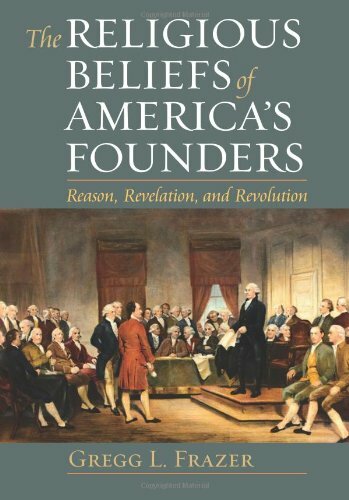 One of the many strengths of this book is that it does not focus solely on the founders it is primarily targeting, but also provides some genealogy for the principles undergirding the theistic rationalist perspective. Frazer achieves this in two chapters devoted to influential theologians and clergymen of the time. In these chapters he offers a strong argument for a broad intellectual, religious culture in America, which attempts, over the course of the eighteenth century, to meld traditional Christian dogma with enlightenment principles. He rightly asserts that it took creative misreadings of scripture in order to make a harmonious blend of enlightenment principles and Christian dogma, and where these conflicts did arise, enlightenment principles won out. [*293] He concludes that although the theistic rationalism that developed out of this process was limited in its influence, it was in fact commonly accepted among the most educated and influential Americans of the time, contributing in important ways to the revolution itself. Among the founders, it is Jefferson, Franklin and Adams who provide the most grist for the historian’s mill, and among those who wish to claim the various founders for their own camps, the tendency has been to claim Jefferson and Franklin as Deists and Adams as a stalwart Christian. In chapters dedicated to each of them, Frazer provides a generally convincing argument that such facile circumscriptions are not borne out by their writings. Frazer sensibly places emphasis on their private correspondences over their public proclamations, and provides ample evidence to show that Adams was less of an orthodox Christian, and that Jefferson and Franklin were less Deistic than many suppose. Some of Frazer’s arguments are less convincing than others. In particular his claims that Jefferson believed in revelation, and that Adams did not believe in the deity of Jesus require more evidence. In general, however, his claims are well substantiated with multiple sources offered. As Frazer pores over the writings of individuals who had relatively little to say in regards to religious questions, it is easy to give more weight to their sparse words on the subject than they warrant, falling victim to the illusion of saliency. Frazer has a clear incentive here to group as many significant founders as he can under the heading of theistic rationalist. Yet, with the group examined here, it may be more accurate to acknowledge that as far as we can tell from their writings, they simply were not overly inclined towards religious questions. Frazer claims rightly that the term deism is often used as a catchall for anyone at the time who was not a Christian. Yet Frazer seems to fall into the same trap with his own term. In these chapters he spends a great deal of time parsing out instances where each of these founders seem not to fit into either the Christian or Deist camp. Yet while one may be inclined to agree with Frazer that these founders were neither Christians nor [*s94] Deists, it does not follow that they therefore must have been theistic rationalists. Frazer relies on excluding them from the former categories as evidence that they must belong to the latter, when not enough evidence is provided to substantiate that claim on its own. Frazer clearly thinks that it is important to identify and name a particular religious category to encompass these founders’ beliefs. I am less convinced of that. The question at hand is whether this effort to identify a specific category of religious belief gets us any closer to a meaningful or useful understanding of these founders’ perspectives, or whether we would be better served by recognizing their idiosyncrasies, affirming that they do not fall neatly into any established camps, and taking from this ambiguity a broader lesson about how difficult it is to pin down the religious beliefs of thoughtful people. These and many other curious individuals throughout history, both notable and otherwise, have held disparate and ephemeral viewpoints that are neither consistent nor easily categorized. It may be that we gain a deeper understanding of practiced religion by eschewing the scholarly desire to categorize, and that we instead seek to advertise, as Frazer has essentially done here, the widely variegated form that religious belief and practice takes when looked at through the prism of individuals rather than institutions. Stepping back from the attempt to place the founders under particular headings, one finds a broader, more substantive and to my mind more important argument being made here. Through thorough research and marked erudition, Frazer illuminates a maelstrom of differing theological perspectives among a group of Americans that we often refer to glibly as Christian or Deist. Frazer’s book expands our notions of what these people believed about God, scripture, the afterlife, and other “Christian” dogmas, and contributes to the understanding that America’s religious history has always been deeply and fundamentally plural. It is true that short-hand terms such as Christian, Deist, theistic rationalist are necessary at times, but for those who wish to think through America’s religious history in more intricate and nuanced terms, this compelling book provides just such an opportunity. Some readers may come away from this book with a new set of categories. But all readers should benefit from a deepened understanding that the founders, however we label them, were not themselves limited in their thinking by the appellations we seek to bestow upon them. Humphrey Taylor. 2009. “What People Do and Do Not Believe In,” THE HARRIS POLL 140 (December 15). http://www.harrisinteractive.com/vault/Harris_Poll_2009_12_15.pdf. Zuckerman, Phil. 2008. SOCIETY WITHOUT GOD. New York: NYU Press. Copyright 2014 by the Author, Dylan Weller.